That is such a very pretty card ! I hope you and all the family are well ? Pat, I just love step cards - and yours is amazing! I really love this card Pat, I think its soooo cute. Love your side step card. I keep meaning to try one and I just haven't yet. Love seeing all those beautiful Cheery Lynn Dies...Thank you for joining us this week at Cheery Lynn Designs Challenge and good luck!!! Pat this is a gorgeous card, I keep saying I am going to try one of this style. Your image is adorable and I love your embellies. Pat: Your side stepper card is just wonderful, and perfect for our Challenge #33 - "Easter [or Bunnies]"! This is lovely Pat. The image and embellishments team perfectly with the check background. Fabulous card - great image and love the papers. Thanks for joining us at Polka Doodles this week. Karon, DT Polka Doodles. Great card hun, fab papers & I love the dies you have used! This is an amazing step card! Love all of your fabulous details! Just beautiful! 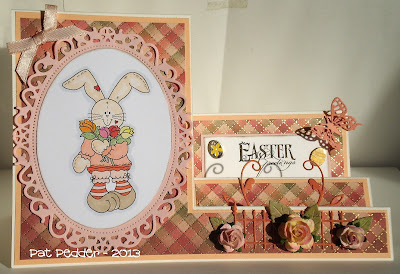 Hi Pat I love, love this gorgeous card, the side stepper card fold looks ACE, so do the paper, colours and the Bunnies, ACE creation for Easter.